Passion and dexterity combine into a breathtaking and beautiful experience when the C4 Trio play together. The three virtuoso cuatro players, met in 2005 at the Siembra del Cuatro contest where they were individually competing. A casual jam session led to the formation of a project that has brought them multiple awards and appearances throughout South America, the US and Europe. 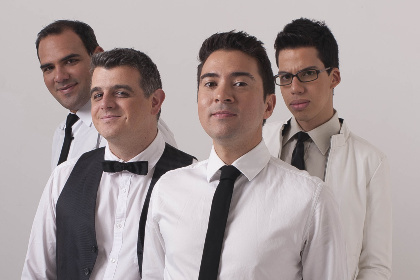 Their first album achieved Gold status, the next won them a Latin Grammy and in 2014 they scooped up no less than seven Pepsi Music Awards for their De Repente album collaboration with Rafael ‘El Pollo’ Brito. That same year they were joined by bassist Gustavo Marquez. C4 Trio’s performances are a refreshing blend of stunning virtuosity and engaging good humour. Uno, dos, tres cuatros!